There are over 600,000 bridges in the United States and almost 13% have some sort of structural damage. Most bridges still require field methods to assess this damage, including visual inspection, dye penetrant testing, magnetic particle testing, and ultrasonic techniques. These field methods can miss structural problems or fail to catch them in time to prevent a catastrophe. 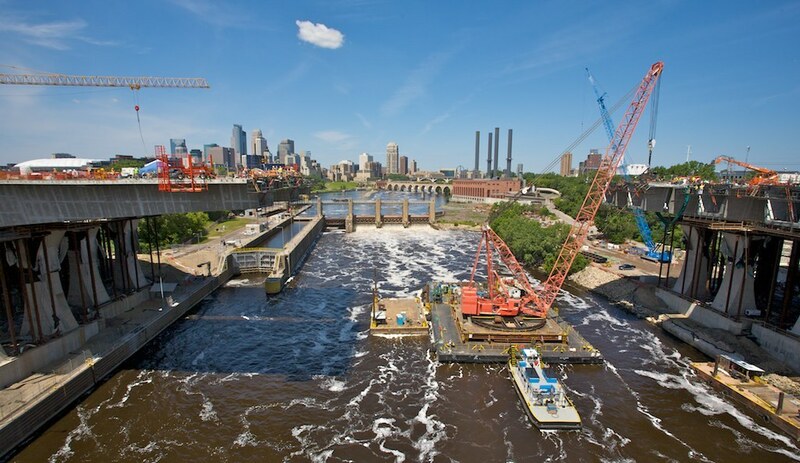 In the case of the Minneapolis steel truss bridge that collapsed in 2007, resulting in 13 lives lost, the National Transportation Safety Board (NTSB) ruled that 16 of the gusset plates that connected the trusses failed. Smart bridge technologies are being implemented in the redesign, providing more efficient and real-time monitoring and inspection. This tragedy may have been prevented had the bridge been equipped with a network of smart bridge sensors providing continuous monitoring of various properties. For instance, the six-lane, 2.9 km (2 mile) Charilaos Trikoupis Bridge (Rion-Antirion Bridge) in Greece has 100 sensors (300 channels) that monitor its condition. Soon after opening in 2004, the sensors detected abnormal vibrations in the cables holding the bridge, which led engineers to install additional weight to dampen the cables. Only a handful of other smart bridges across the globe incorporate sensors of various types, including accelerometers, strain gauges, anemometers, weigh-in-motion devices, and temperature sensors. The Tsing Ma Bridge in Hong Kong, the world's seventh longest suspension bridge, is equipped with more than 350 sensor channels. The bridge, which can handle wind speeds up to 212 miles (341 kilometers) per hour, uses GPS sensors mounted on the towers and cables to measure wind speed. About 100 photonic sensors are used to monitor the strain on the bridge’s cables. Additional smart bridges in action include the following. Geumdang Bridge, South Korea: Low-cost wireless sensors monitor the bridge’s response to speeding and overloaded trucks. Gi-Lu Cable-Stayed Bridge, Taiwan: Wireless sensors and accelerometers monitor its structural health. Brooklyn Bridge, New York City: Fiber optic sensors measure displacement and temperature. Bill Emerson Memorial Bridge, Cape Girardeau, Missouri: Strong-motion sensors,at a cost of $15,000 per sensor, acquire and transmit data via Ethernet. 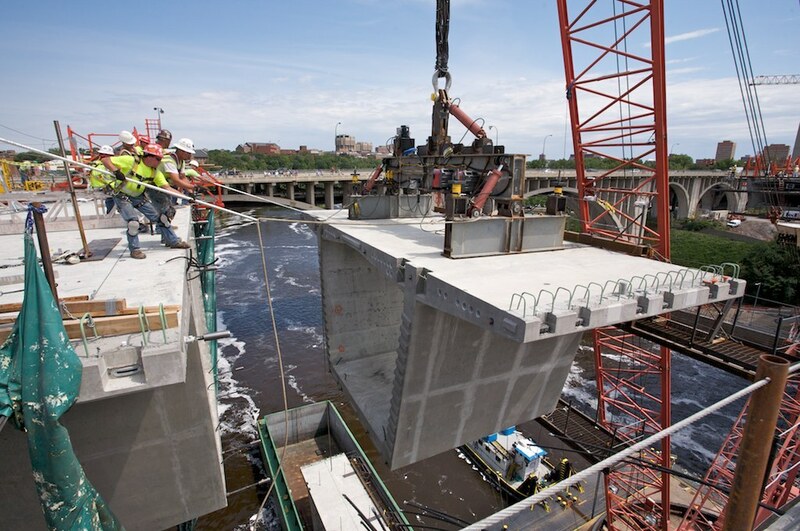 The St. Anthony Falls Bridge, the I-35 bridge which replaced the Minneapolis bridge that collapsed, was constructed in a joint venture between Flatiron-Manson and Figg Bridge Engineers. Completed in September 2008, the bridge was constructed with two parallel structures, one for each direction of traffic, using prestressed concrete box girders. 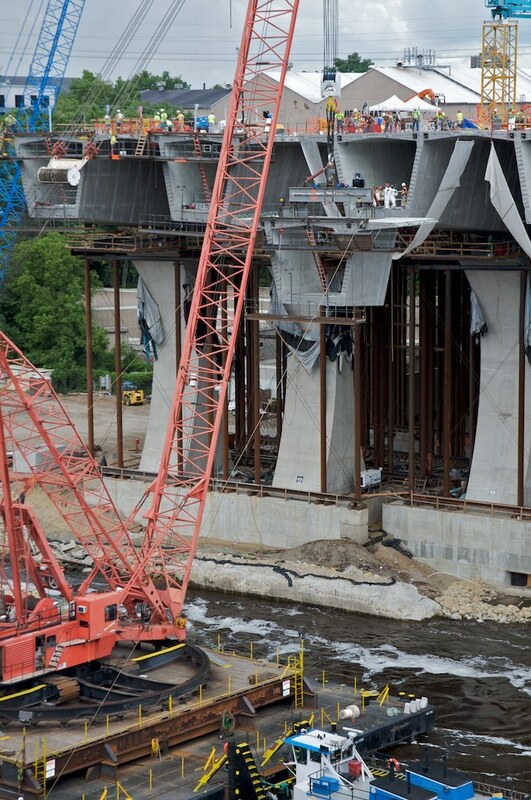 The river span used precast segmental construction and the remaining three spans used cast-in-place concrete. The total cost for the sensing system was about $1 million, a small fraction of the bridge's $234 million price tag. Over 500 off-the-shelf sensors collect data regarding structural behavior and corrosion on the St. Anthony Falls Bridge. Structural deformations are measured by 195 vibrating wire strain gauges (VWSGs), 24 resistive strain gauges, and 12 fiber optic displacement sensors. These fiber optic sensors, which provide overall curvatures of the river span for calculating deflections, are mounted in six pairs at the top and bottom of the exterior box girder of Span 2 (the middle span that crosses the river). Temperatures in the bridge and thermal gradients throughout the structure are measured by 243 thermistors, including those integrated into the strain gauges. These thermistors and the vibrating wire strain gauges (VWSGs) are distributed throughout various sections along the length of both structures at key locations. 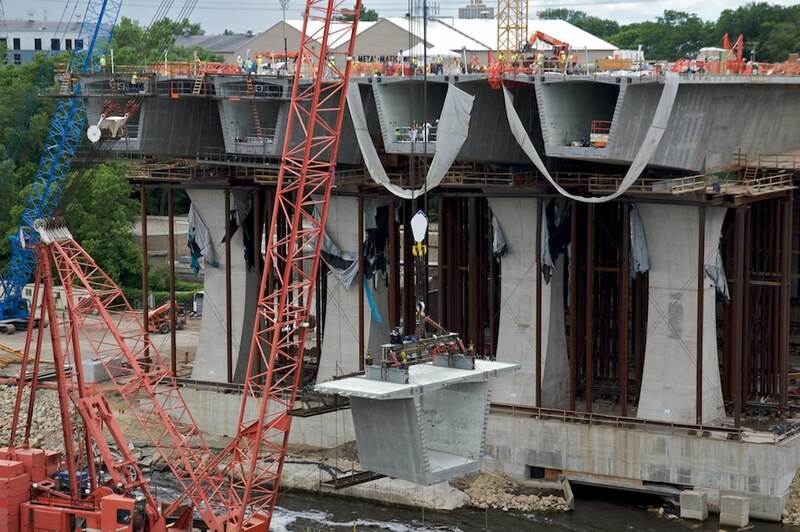 One VWSG was installed in the top and one in the bottom flange at the centerline of each box girder. There are a total of 26 accelerometers measuring modal frequencies of the structure to calculate deflections and structural vibrations. Half of these are installed at the midspan of each box girder in each span and the other half are located along the exterior box girder of southbound Span 2. These 13, which were installed to collect additional information for future instrumentation, can be oriented in different directions and are uniformly distributed at the corner of the top flange. There are 12 linear potentiometers installed at the expansion joints to measure the overall expansion and contraction of the bridge. There are four corrosion sensors (provided by Corsensys) that are included in the deck to determine the susceptibility of the reinforcement to corrosion. These sensors, which are located in the reinforcement strand (a cable wrapped in multiple layers of steel wire), measure the corrosion current, the concrete electrical resistivity, and the concrete temperature to determine the initiation of corrosion, the corrosion rate, water content of concrete, and transport processes of water and chlorides. Abnormal fluoride levels may indicate corrosion so that corrective action can be taken. 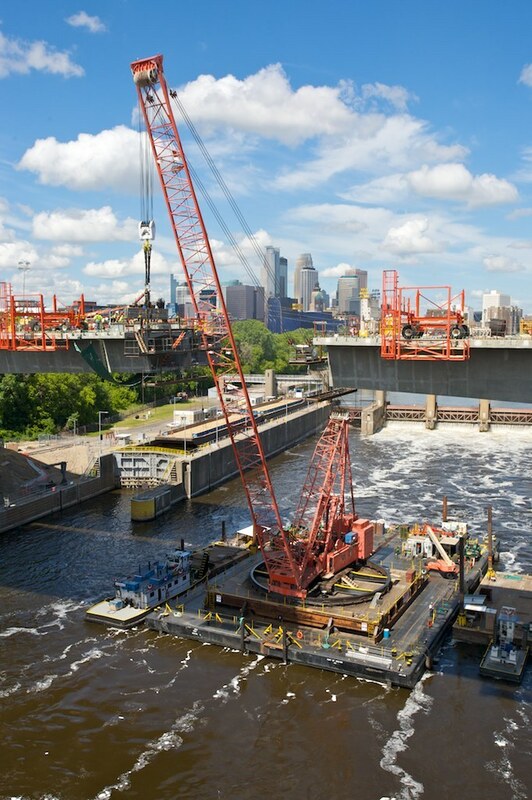 The University of Minnesota is collecting and analyzing the data collected to better understand the behavior of the girder structures and will eventually develop a system for long-term monitoring of the bridge. Some of the information is redundant so different types of sensors can be analyzed. Baseline behavior was established during the first year of operation. Models employing the finite element method (FEM) have been developed to compare measured data to predicted data and to provide a tool that can make predictions regarding long-term monitoring. Modal frequencies calculated from the FEM model correlated well with measured frequencies. Thermal effects were found to cause much larger strains than those caused by truck loads. Creep and shrinkage test results will be incorporated into future models. The corrosion sensors are the only types of sensor in this case that can indicate problems at specific locations. Global measurements obtained from the other sensors cannot be used to detect local defects. Data from the other sensors thus must be combined and evaluated by using models to determine the bridge curvature and how the entire bridge is responding. The long-term monitoring system will be based on an expected response that can be monitored by the maintenance department. Any change in response, such as curvature of the bridge that is derived from combined measurements, will be an indication that something is wrong. The predicted response of thermal data will likewise be compared to measured data: if there is an out-of-bounds condition, the maintenance department will be notified. Hands-on inspection will still be needed to take a closer look after a potential problem is identified. Because most of the current sensor technology cannot pinpoint what is happening at specific locations, other organizations are developing state-of-the-art sensors with funding from the National Institute of Standards and Technology (NIST) and other organizations. The University of Michigan is developing a sensing "skin" (a paint or coating incorporating a sensor) based on carbon nanotubes. When stimulated with an electric current, these sensors will be able to identify where a crack is located or other damage beneath the surface. However, this technology is still several years away from being commercialized and is currently cost-prohibitive. Wireless technology is also being developed at several organizations. The University of Texas at Austin is studying how to use the vibrations of the bridge to generate electricity for devices that will sense cracks. Solar energy is being used to power sensors at the University of Maryland. At the University of California (San Diego), researchers are using piezoelectric sensors, which can both send and receive high frequency tones right through a bridge, to find cracks. Several systems based on fiber optics are being developed at the University of Missouri at Rolla. One system monitors general performance and health of the structure, while the other system interrogates the behavior of a major structural repair. Test bed structures are also required to evaluate both current and future sensor systems. At the University of Illinois-Chicago, research is focusing on the implementation of a structural health monitoring system on a full-scale bridge structure. The test bed is a 1912 steel truss bridge in Mahomet, IL, which is exposed to extreme temperature fluctuations and frequent floods. A series of dynamic tests using a state-of-the-art wired sensor system has been conducted since January 2007. Numerical model updating using the experimental data and validation of developed damage detection algorithms is underway. In the near future, smart sensor networks will be implemented using a Motorola phone base station on this bridge. Another important program that will help to bring smart bridge technology to practical reality is the Federal Highway Administration’s (FHWA) Long-Term Bridge Performance (LTBP) program. This 20-year program is being led by Rutgers’ Center for Advanced Infrastructure and Transportation (CAIT) and involves the instrumentation of a number of highway bridges across the country. LTBP hopes to provide a more detailed and timely picture of bridge health and improve knowledge of bridge performance. Bridge performance is defined as how bridges function and behave under a variety of complex interrelated factors, such as traffic volumes, loads, and environmental conditions (freeze-thaw cycles, rains, or high winds). Laurel M. Sheppard is an award-winning writer and editor who has authored several hundred articles related to ceramic materials technology and other engineering fields. She has a B.S. in ceramic engineering from Ohio State University and previously held editorial positions with Ceramic Industry, the American Ceramic Society Bulletin, Advanced Materials and Processes, and Materials Engineering. Her writing and editorial achievements have been recognized by the Society for Technical Communication, American Society of Business Press Editors, and Communications Concepts, Inc. She has also authored over a dozen market reports on various materials technologies and has written articles for IEEE’s Computer Graphics and Applications, Software Strategies, Native Peoples, SWE Magazine, and other publications.